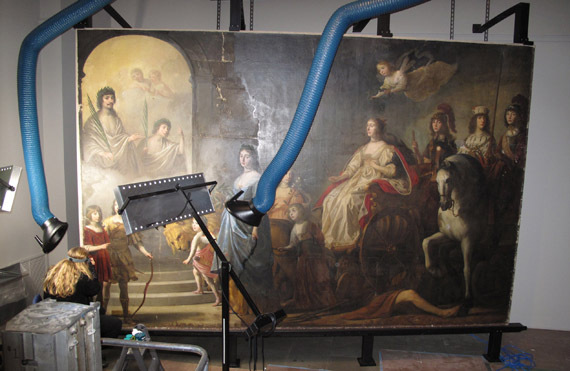 In January 2011, conservators raised the curtain on their work as they cleaned and conserved the enormous The Triumph of the Winter Queen: Allegory of the Just by seventeenth-century Dutch master Gerrit van Honthorst. Conservators usually work behind the scenes, but this painting is so large (about 10 x 15 feet) that a new studio space was created especially for its treatment. Over the course of 18 months, conservators carried out their work on view to the public; see the progress updates posted below. 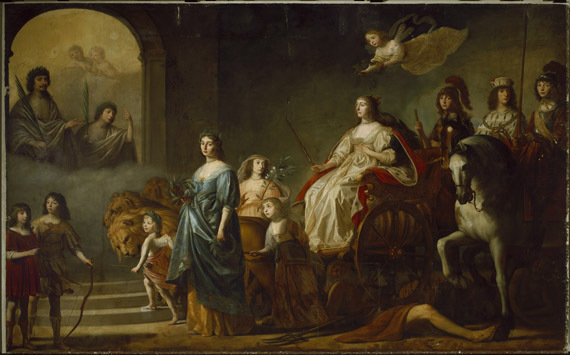 Signed and dated in 1636, the painting is part allegory, part family portrait. Elizabeth Stuart, the recently widowed “Winter” Queen of Bohemia who was living in exile in the Netherlands, probably commissioned the painting for a hunting lodge at Rhenen, near The Hague. Scepter in hand, Elizabeth sits atop a wagon drawn by three lions. She is surrounded by her 13 children, some living and some dead. Among the latter is her eldest son, Frederick Henry, who appears at upper left with his father, the deceased “Winter” King; both hold palm branches and are bathed in a golden, celestial light. The figure under the chariot’s wheels is Neptune, ancient Roman god of water and the sea, whose trident pokes out from under the cart. He is getting his due. The painting’s title, The Triumph of the Winter Queen: Allegory of the Just, alludes to the fact that Frederick Henry had drowned in an accident in 1629. A. Elizabeth, 1596–1662; B. Frederick V, 1596–1632; 1. Frederick Henry, 1614–1629; 2. Charles Louis, 1617–1680; 3. Elizabeth, 1618–1680; 4. Rupert of Rhine, 1619–1682; 5. Maurice, 1620–1652; 6. Louise Hollandine, 1622–1709; 7. Louis, 1623–1624; 8. Edward, 1625–1663; 9. Henrietta Maria, 1626–1651; 10. Philip, 1627–1650; 11. Charlotte, 1628–1631; 12. Sophia, 1630–1714; 13. Gustavus Adolphus, 1632–1641. The Winter King and Queen take their nicknames from the shortness of their reign. They were actually Frederick V, Elector (ruler) of the Palatinate, and Elizabeth Stuart, daughter of England’s King James I. In 1619 Frederick, who ruled portions of Germany, was selected as King of Bohemia (roughly today’s Czech Republic). Central Europe was divided by fierce religious and political conflict at the time, and Frederick’s selection helped ensure the slide into war. Frederick was a Protestant, as were many of his Bohemia subjects, but most of the surrounding powers were Roman Catholic. As soon as Frederick was crowned, the Holy Roman Emperor, a Catholic, claimed Bohemia as well. After just a year in power, Frederick and Elizabeth were driven into exile; the conflict was a key early moment in the Thirty Years’ War that ravaged central Europe. Honthorst had spent a decade studying in Rome, where he was influenced by the work of Caravaggio. However, by the time Elizabeth commissioned him to create a pair of grand allegorical paintings, he had moved to a courtlier, more refined and colorful painting style. One of these two portraits, which survives only as a fragment, explored the family’s trials and hardships. The other, The Triumph of the Winter Queen, was used by Elizabeth to affirm her family’s right to the Palatinate and to convey her conviction that they would succeed in overcoming their misfortunes. Elizabeth, who died on February 13, 1662—the day before what would have been her 49th wedding anniversary—lived to see her son, Charles Louis, regain control of some of these lands in 1648 with the end of the Thirty Years’ War. But it was through her daughter, Sophia of Hanover, whose son became King George I of England, that the legacy of Elizabeth Stuart and Frederick V continues to this day. The painting is in remarkably good condition given its age, size, and many travels. There are some tears and other damage, but those have recently been repaired by “lining” the canvas—or adhering a new piece of cloth to the back. The painting is also much darker than the artist intended. Centuries’ worth of grime, discolored varnish, and old repaint have accumulated on the surface. The aim is to remove this veil. A thorough technical examination will be conducted during treatment, using a number of scientific techniques to determine the painting’s original construction and current condition. Various tools allow conservation scientists to see underneath the paint surface, including ultraviolet energy (“black” light), infrared energy, and the analysis of tiny cross sections of paint under magnification. Information from these tests will help build a clearer picture of how the painting was made and how it has changed over time. That knowledge, in turn, will help conservators make decisions about treatment—what to do and how to do it. Inevitably, the process will reveal areas of damage, as old repairs, as well as dirt and varnish, are removed. After cleaning, the process to restore the damaged parts will involve carefully filling the areas of loss with a putty-like material similar to the one Honthorst used for the painting’s ground layer. These areas will then be painted using chemically stable paints that are specifically made for this purpose. 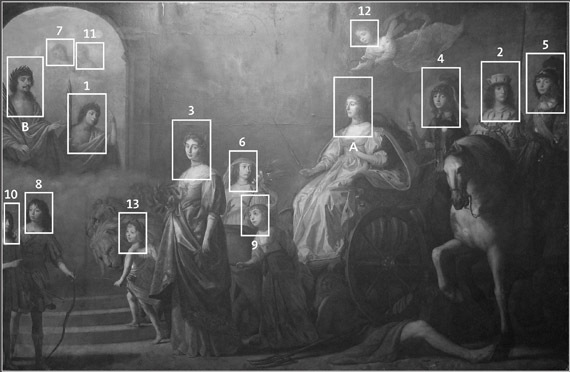 When the treatment is complete, the repairs will be imperceptible and viewers will be able to enjoy the painting as Honthorst, and the Winter Queen, intended. See below for updates as treatment progresses.